In 2017, Frost & Sullivan kicked off its “Digital Transformation in Aviation” research initiative, running a series of global airline and airport surveys, aiming to understand the current state and future digital vision of operators. Each survey run for approximately 3 months, was sponsored by select end-users and industry suppliers, and consisted of interviews with a minimum of 50 end-user IT and Digital Transformation directors. 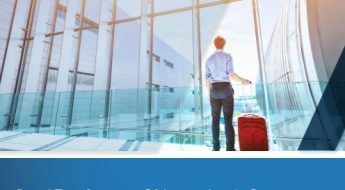 The following presents an overview of the key topics covered in the discussions with airport end-users, complemented by Frost & Sullivan’s own insights from published research reports on airport IT systems and airport landside/airside services. Under Data Visualization and Analysis, airports place projects related to data discovery, data exchange, data integration and analytics, which are all typical functions of an IoT (Internet of Things) environment, aiming to improve situational awareness. The largest, and most impactful, project in this workstream is the Operations Control Room (OCC), which is the command centre of the airport. Investments focus on expanding the role of the OCC, beyond security, and integrating new data sources to enable the concept of Total Airport Management. Beyond data integration and enhanced visualization, new technologies that are being explored include artificial intelligence (AI), with applications focused on predicting KPI performance, and the use of digital twins to manage big (and real-time) data. 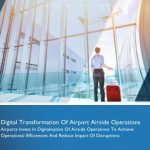 A welcomed outcome of digital transformation is that airports move beyond their reactionary “day of operations” mindset and are now able to plan well ahead, running multiple scenarios and adjusting forecasts with real-time data, thereby becoming more resilient. Indeed, disruption management begins in the OCC. Under Infrastructure, airports consider projects related to data storage, whether cloud or on premise. However, the biggest impact project in this workstream is cybersecurity, as airports rely less on IT suppliers and more on their own resources to safeguard systems and data. AI, Edge Analytics and Blockchain are some of the most promising technologies in this workstream. Passenger and bag journey projects assume most publicity and are a major investment area for an airport. Focus is on increasing passenger and bag throughput capacity through automation and improving customer satisfaction through the enablement of a friction-free passenger experience, from curb to gate. Impactful projects relate to advanced baggage handling systems, self-service passenger touchpoints and enhanced passenger and baggage screening at security checkpoints. Most industry initiatives, including ACI’s and IATA’s New Experience in Travel and Technologies (NEXTT) program, focus in this area too. Biometrics, AI and Robotics are increasingly sought-after technologies in this workstream. The Airside Operations workstream includes all projects that aim to improve airside efficiency, capacity and safety. Airside investments are focused on five key areas: Gate and Apron, Airfield, Tower, Operations Management and Safety and Security. 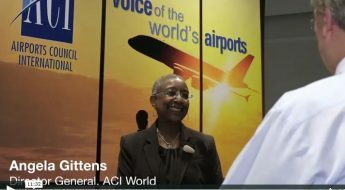 Collaboration is key in airside operations and is another focus area for industry-wide initiatives as evident by A-CDM and ACI’s Airport Community Recommended Information Services (ACRIS). Airside will also be the biggest implementation area for AI and Autonomous operations, being a controlled area with pre-defined routes and roles for staff, motorized and non-motorized equipment. Administration includes internal operations management and all aspects of asset and facilities management. Projects focus on improving energy and waste management, as well as asset utilization and predictive maintenance. As with all other workstreams. AI is to play an important role in this workstream, as a key enabling technology. Global Airport spending on Airside Digital Transformation, will increase from $4.58 billion in 2018, to $5.6 billion by 2023; the highest growth segment is Operations Management, which will grow from $960 million to $1,180 million in the same period. Investments are centered on A-SMGCS, VDGS, approach optimization and flow management systems, ALCMS, A-CDM, AOCC and analytics-based forecasting systems. Global Airport spending on Landside Digital Transformation, will increase from $3.9 billion in 2018, to $4.6 billion by 2023; the highest growth DT segment is self-service systems, which will triple from $220 million to $660 million in the same period. Investments are centered on common use platforms, cloud data storage, smart security and passenger flow management. Digital Transformation programs are designed and managed by Airport IT departments, aim to enhance customer experience and last an average of 5 years. The DT vision entails implementation of projects to improve the passenger experience and operational efficiency, while moving from a process driven to a customer focused business environment. The future airport will be built on data. Over 90% of data captured by airports today are not being put in use, other than featuring in visualization applications. There is substantial potential for optimization through big data analytics and use of Artificial Intelligence. Eventually, airports will migrate to an ecosystem where data collaboration among stakeholders will be efficient, systems will be interoperable, and passengers will have greater control over their journey through personalization. Disruption Management offers most potential for both airport operators and technology vendors, as there are no airport wide solutions available today in the market. The customer satisfaction, cost savings and cost avoidance associated with effective disruption prediction, management and recovery, are substantial. The major reasons for delays in implementation of Digital Transformation programs, as well as overall airport innovation, are resistance to change, cost of implementation and weak business case development. Furthermore, among the global airports we interviewed, we can conclude that for most airports (68%) DT programs are still in progress. Below are some of the key projects invested in landside and airside. In the age of Industrial Revolution 4.0, airports are at a state that Frost & Sullivan defines as “Airport 2.0.” Processes are now being digitalised and moving towards the cloud. However, databases are not fully integrated, analytics are not widely used, and automation is low beyond core processes such as baggage handling. Due to their complex environment and numerous stakeholders being involved at any given process, the pace of transformation is slower than other industries and certainly lacks the maturity witnessed by airlines. 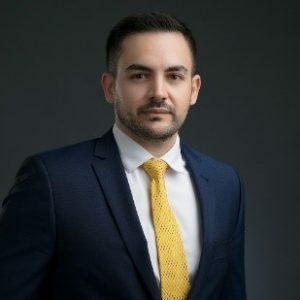 Article written by Diogenis Papiomytis, Global Director of Commercial Aviation, Frost & Sullivan. Published on ADB SAFEGATE with permission of Momberger Airport Information.